Americans were used to stories about how Barack Obama drew standing ovations in every country he visited. So it was a bit surprising to see this Jerusalem Post headline: “Pence Speech Rife with Biblical References Rocks the Knesset….VP Pence’s Biblical speech to Knesset met with multiple standing ovations.” The New York Times spin was dramatically different. They couldn't even mention the ovations on that day, only the Pence visit being boycotted by Arab Christians. Once again, the New York Times took sides in the Israeli-Palestinian conflict, being dismissive of Jewish victims of Palestinian violence. Isabel Kershner reported from Jerusalem on the wave of stabbings of Israelis by Palestinians under the headline "Israeli Retaliatory Strike in Gaza Kills Woman and Child, Palestinians Say." There is an extremely strange emphasis in both that headline (what, precisely, was Israel retaliating against?) and the underlying article, which skipped what Israel was retaliating against until paragraph seven, while beginning with the deaths of Palestinians during the "retaliation." A follow-up article faulted the Israeli government's "clampdown" for contibuting to the "cycle of violence," a phrase that puts Palestinian murderers and Israeli self-defense on equal moral footing. The morning after Israeli Prime Minister Benjamin Netanyahu's surprisingly easy victory against left-wing opposition, the New York Times was still sore. Columnist Thomas Friedman: "It is hard to know what is more depressing: that Netanyahu went for the gutter in the last few days in order to salvage his campaign -- renouncing his own commitment to a two-state solution with the Palestinians and race-baiting Israeli Jews to get out and vote because, he said, too many Israeli Arabs were going to the polls -- or the fact that this seemed to work." Jodi Rudoren, the Jerusalem bureau chief for the New York Times, is often criticized as anti-Israel and hostile in particular to conservative Prime Minister Benjamin Netanyahu. In the wake of a tighter-than-expected reelection campaign and Netanyahu's controversial speech to Congress, in which he warned of the dangers of a nuclear Iran, the Times truly "doubled down" on its hostility, accusing the PM of being panicky, power-hungry, and appealing to racism. The New York Times' labeling bias isn't just aimed at U.S. conservatives; the Times' global reach and bias extends overseas, as demonstrated in Wednesday's New York Times was crammed with dangerous and unpleasant right-wingers in Europe, Asia, and of course Israel. Over at Hot Air on Tuesday night, Mary Katharine Ham pointed to a headline at the New York Times, present at its web home page as well as at the story itself, which equally blames Hamas and Israel for the end of their cease-fire: "Rockets From Gaza and Israeli Response Break Cease-Fire." 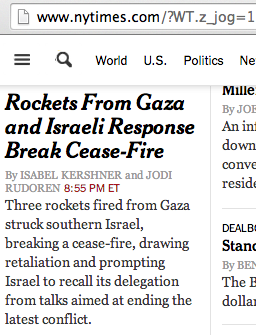 Someone needs to tell Isabel Kershner and Jodi Rudoren that it's the "rockets from Gaza" which broke the cease-fire. As a ceasefire takes hold in Israel, a review of the most recent New York Times coverage of the conflict shows old anti-Israel patterns die hard, with the paper's Jerusalem bureau chief bizarrely suggesting that "in Israel, open discourse and dissent appear to be among the casualties of the monthlong war in Gaza." No mention was made of the violent threats made by the Hamas dictatorship against both journalists and critical Palestinians. The New York Times' coverage of the ongoing situation in Israel, which began with the kidnapping and murder of three Israeli teenagers, continued this past week to be marked by intense anti-Israel bias in tone and labeling, and overwhelming emotionalism over the deaths of Palestinian civilians in the crossfire (Israeli deaths from terrorism rarely if ever merited such heart-felt treatment). After the tragic deaths of four young Gazan boys on a beach, the Times let its photographer hint at something sinister: "Children, maybe four feet tall, dressed in summer clothes, running from an explosion, don’t fit the description of Hamas fighters, either." New York Times Jerusalem Bureau Chief Jodi Rudoren's straightforward lead story Thursday, "Israeli Invasion of Gaza Is Likely, Official Says -- Brief Cease-Fire Is Set," was accompanied on the front page by a large, tragic photo of dead children over an emotionally manipulative story by Anne Barnard, "Boys Drawn to Gaza Beach, and Into Center of Mideast Strife."